Summary Single drive "family" NAS focused on simple file storage, sharing, backup and media playing. Comes in 2, 3 and 4 TB capacities. In February, we took a look at the Seagate Wireless Plus. Despite some quirks in the firmware and on the Android and iOS apps, I liked the little device. Seagate recently sent its Central for review. The Central is aimed squarely at folks who don't know, or even want to know, what a "NAS" is. All they know is that they want to get their media files that are scattered on various household devices into one place where they can be played both while home and away. In many ways, the Central is like the Wireless Plus. It uses the same Android and iOS apps for access and media sharing. It has many of the same backend features such as DLNA media sharing, AirPlay for Apple devices and broadcast to Samsung Smart TVs. In other ways, however, it's very different. It's Ethernet vs. wireless and its feature set is rather slim compared to the Wireless Plus. And it's not portable, either. The heart of the Seagate Central is a 700 MHz Cavium Econa CNS3420-700BG ARM SoC with 256 MB of RAM. You can see the Econa CPU on the left side of the image below. 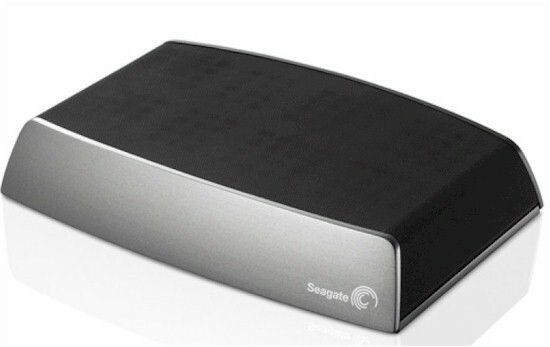 The hard drive included with the 2 TB version of the Seagate Central is a Seagate Pipeline (ST2000VM003) which you can see in the image below. (The Central also comes in 3 and 4 TB capacities.) You can see that the drive makes up most of the Central's footprint. The Seagate Central doesn't have a lot for callouts. The front of the unit is a clean, smooth surface, while the rear houses a power connection, a Gigabit Ethernet jack and a USB 2.0 port which you can see in the image below. A reset button is on the bottom of the unit and a subtle power / status indicator can be seen through the Central's mesh cover in the top front right corner. The Central's UserGuide says the USB 2.0 port on the rear "provides a convenient way to transfer files from your Seagate Central to a portable drive". Upon plugging in a USB drive, it simply shows up as a folder in Windows Explorer. From there, you can drag and drop files and folders in either direction. Setting up the Seagate Central is a relatively easy process. Unbox it and the very large power adapter that comes with it, plug in the included Ethernet cable and give it power. The LED on top turns solid green in about 2-3 minutes and you are ready for the next step. The Quick Start Guide has you go to a general page that doesn't actually connect you to your Seagate Central, but rather gives you tips and tricks on how to get going. In a way, the general page that wasn't connecting to my Central was sort of confusing because once I clicked the Start Here button, the next page told me an important firmware update was available and showed steps on how to run the update. In reality, my Seagate Central had the latest firmware installed. The default page did no harm, but the large orange "Important firmware update available" gave me pause and sent me on a wild goose chase. The next steps mention that within one minute the Central should appear in the Network section of Windows Explorer. It didn't do that for me, so I followed the next steps of installing the Seagate Central Discovery tool, which worked great.